This time, things are a wee different. I'm still revising--I have another hundred pages with the climax still to come--and when I'm finished with this draft I want to print it out, scrawl over it, highlight and cross through things. I want to either post parts of it on the AbsoluteWrite forums or send it to friends or writing contests for feedback. Those tactile moments with your work are the fun parts and as for the critique, well, what doesn't kill you makes you stronger. 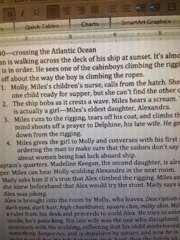 Clearly, a scene-by-scene outline is the best way to figure all of this out. It's certainly easier than reading a 350-page book over and over, isn't it? It cuts down to the building blocks of the novel. 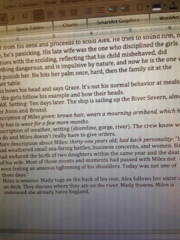 I'm writing out the setting of the scene first. If the POV is not Miles (third person limited, filtered through the character), then I note whose POV it is. If there's description at the beginning, then a bullet point of the setting follows (i.e., church. Stone, ivy, old, square tower...). If not, then there's a sentence about what's going on at the beginning of the scene. Then the action of the scene plays out, listed with numbers. If there's a transition, I note the line or paragraph that transitions into the next scene. I'm pretty weak with transitions; I tend to jump onto the next scene without any connective tissue. If there's a page break, I note it down. When there's character description, I either quote it or list it and italicize it. If I think there's an info dump, I note it. I've only outlined up to the middle of chapter 4 and already, I see a scene I can happily cut. This very detailed outline is not one I could ever do before writing a first draft. It's a little tedious, but at least I know that it'll help me identify what needs work without having to go through the whole entire thing to find it. Anybody out there do a post-draft outline? I'd love to hear about how you organized yours. If you're an outliner, how detailed go you get before you even write a word down? Do you think something like this would help your revision process? And does anybody out there find that they have anxiety dreams as they're coming up to the climatic portions of one's work? *Info dump: exposition. a term used by writers to describe paragraphs and paragraphs of obvious research, backstory, or context that goes on and on and on.